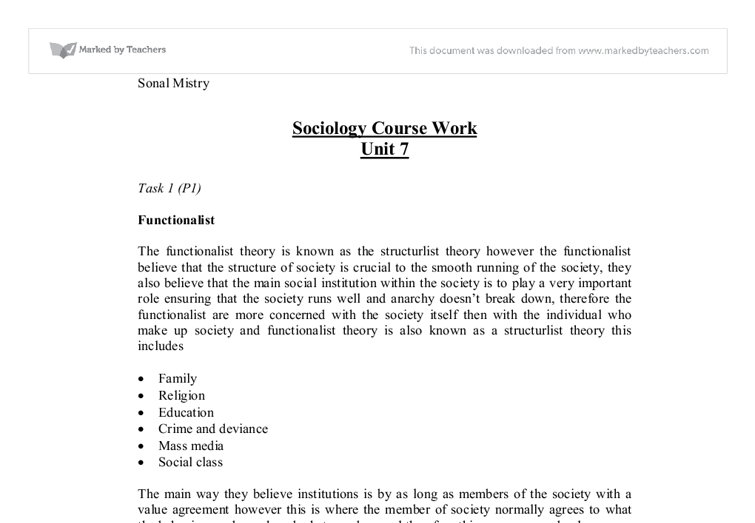 Sociology Course Work Unit 7 Task 1 (P1) Functionalist The functionalist theory is known as the structurlist theory however the functionalist believe that the structure of society is crucial to the smooth running of the society, they also believe that the main social institution within the society is to play a very important role ensuring that the society runs well and anarchy doesn't break down, therefore the functionalist are more concerned with the society itself then with the individual who make up society and functionalist theory is also known as a structurlist theory this includes * Family * Religion * Education * Crime and deviance * Mass media * Social class The main way they believe institutions is by as long as members of the society with a value agreement however this is where the member of society normally agrees to what the behaviour and are ok and what are abnormal therefore this our norms and values. Functionalists believe we are socialized by the social organization - especially within the family so that they can act within an acceptable way for example the people who are walking on the streets may be eating a packet of crisps and after they finish in stead of dumping the packet on the floor they throw the packet of crisp in the dustbin this person has acted in a reasonable manner therefore this is what creates a social order and agreement within the society. An example of someone acting in an unreasonable manner this would be dumping the packet of crisps on the floor therefore this would be seen as unacceptable behaviour and the person would be seen as deviant to society. Reference: http://www.revision-notes.co.uk/revision/624.html Website viewed on 5 / 9 / 08 Marxism Marxism is a structurlist theory similar to the functionalist theory. Marxist believed that society is split into two groups, * The 1st group is the bourgeoisie this is the ruling class of the factory owners. ...read more. Society is too obsessed with perfect health so this means we put too much emphasis on perfect, normal health, an example of this would be if a child is born with a facial problem they will want to operate as they want to make the face better and more appropriate. On average us as a society can't cope with things like death and illness, because we're so obsessed with everyone being healthy we tend to have a positive approach so when something bad does happen and we find it hard to adapt to it. Some non-western societies celebrate death they believe in reincarnation. They see it as a good life whereas in our country we see it as a really negative thing. Reference: Stretch B, BTECH national health studies, (heinmann 2002) What is A Disability? Disability - is someone who is physical or mental hurt or injured. It can be either inborn or resulting from an injury or illness etc. It disrupts to some degrees a person's ability to conduct normal life functions for day to day activities such as i.e. football, swimming and other physical tasks. Help and offer assistance - is to support this condition a qualified disability carer can assist a disabled person when they need any help doing tasks and a physiotherapist. There are also associations related to helping and supporting disabilities. The link below offers some good websites to help give disability support in the UK. www.equip.nhs.uk/groups/disability.html Reference: Stretch B, BTECH national health studies, (heinmann 2002) What is The Sick Role? The Sick Role is concept defined by Talcott Parsons in 1951, it is a term widely used in medical sociology. For parsons being sick is not simply a condition, it is a specific patterned social role. For Functionalists people who are ill can be perceived as a disruptive. This is because a large group sick could develop into a sub-culture of non working, dependent people. ...read more. Men are more devoted to sport, smoking; alcohol etc whereas women are more devoted to shopping, occasional drinks and their wellbeing. Also men do tougher jobs than women in the aspect of physical as they choose jobs such as brick laying, construction etc which they have to move their bodies a lot and be really physically fit although men's jobs are straight forward they are a challenge and need a lot of strength to sustain it. I feel women eat a more healthy diet compared to men as they tend to cook more whereas men will rely on convenient food such as takeaways and ready meals which aren't so healthy. An unhealthy lifestyle which may have been wild and fulfilled may well determine a lower life expectancy. What Would Feminists Say? Feminists believe women are so devoted to their jobs, kids, friends etc that they're always involved in everything they try to lead a healthy lifestyle compared to men who are lazy and live off easy-to-do meals but men are more sociable than women in a sense they're more likely to go to the pub while the wife stays at home this is typically why women don't drink as much alcohol as men because when men drink they do it so often that they're used to the amount whilst women will only do it occasionally so won't be used to such a big amount. This is purely why women live longer because they care about their well-being and appearance a woman won't drink loads instead they will devote themselves to their kids they will still see friends but not as often as men see them. As women have more of a role than men they have to tend to the child night and day the child depends on both parents but it's which one it sees the most who it will be attached to. So men's lifestyle and responsibility have a lot to do with the type of life expectancy they will succumb. ?? ?? ?? ?? Sonal Mistry 1 ...read more. in the smaller shops, this means that in some cases cheap and varied food is only accessible to those that have private transport or are able to pay the cost of public transport. " People on low incomes eat less healthily partly because of cost, rather than lack of concern or information. During the first half of the 20th Century, the UK's IMR began to fall. This was due to several reasons: * Improved housing and better sanitation, such as flush toilets and clean drinking water, reduced infectious disease. Infants are much more susceptible to infection because of their less developed immune system. can add exchange-value to a product, and then sells the product for more money than the worker was paid. The capitalist amasses capital by paying the worker less money than the value added to the product by the work done and then selling the product for more money. the economy is the base of all aspects in society and how the superstructure develops according to how the economy develops. Furthermore, Functionalism and Marxism are sociological theories developed in Europe. Functionalism was founded by Emile Durkheim, a French sociologist and Marxism was founded by Karl Marx, a German philosopher. and of sociology. Durkheim was concerned to use the new science of ?sociology? 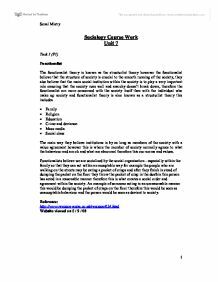 to analyse the very essence of social order. Social order is about how people behave in society. What is classified as what is right and wrong in society. But Erving Goffman (1969) an interactionist describes how we actively construct our ?self? by manipulating other people?s impressions of us. All the world is conceived as a stage and individuals are seen as actors who present a show of their self by putting their ?best foot forward?.